Please will you send me information on both of the above Titles and also explain the difference between them. Two years ago my friend known as 7th.Lord Duffus died. This title I understand as a peerage. Is it? Two weeks ago his sister informed me that as none of the male members of her family want the title, she had it made over to her so that it remains in the family and will not therefore be sold. She is now the legal 7th. Lady of Duff. This I believe not to be a peerage but a landed Title. Is that so? I understand that only Landed Titles can be sold, and that the Title of Lord Duffus can only be passed by blood, and only to male heirs, if so why should she worry about the possibility of it being sold.? She said this Title has been in the family for 300 years. My question - Are there 2 separate Titles and if so which one is this and would her brother have held both of them during his lifetime? If I am wrong, and I can be, if her brother was 7th. Lord Duffus, how can she be 7th. Lady of Duff. Surely there is some error present. I have congratulated her upon attaining the Title, but did not ask her to explain because I did not want to spoil her pleasure. I have been a friend of the family for many years, but have never questioned this, but now I am confused. I would appreciate your assistance in my understanding of this. WOW! The Duffus Website is just wonderful! I can't begin to imagine the time and work that went into creating it. You deserve an award for it! cancer has changed my life, and for the better, I might add. I am very positive about the chemo, though not looking forward to being bald, but if that is the price I have to pay, so be it. Thanks again for your emails and all your work. I shall send you a paragraph about Anna when she gives me one. I look forward to visiting the website again soon. executive management (Vietnam) and one for people in he field (Indonesia). done after ten years.I could imagine your satisfaction in completing this task. I rang Barry and Arlene and told them and arrangements have been made to come and have a look at the site next week so they are looking forward to that.I will let you know what they think about it or maybe you could contact us through the pal excite thing or talk to Arlene on the phone when they come or over the keyboard again anyway think about it .well I must go it is so hot here today we are just into our autumn weather and it is about 40 cels. here.I don't think it will ever cool down.Once again well done on the "duffus page"
I am writing to you following a visit I made to the Duffus Inn, Moray, Scotland last month, where I was given a copy of the history of Duffus which I am led to believe you compiled. I am currently researching my family history and I have reason to believe that I am probably descended from James Sutherland (5th Lord Duffus) who died on 30th June 1826. Any information you have about this gentleman would be greatly appreciated. 3PT - Telephone No. 01982 553215. Thanks very much for all the work you have done and the several e-mail items you have sent in recent months. I don't think I informed you of an addendum to my family tree, i.e. my younger son James Malcolm Stuart Duffus recently married Kathleen Patrice Dolezal. They had a rather nice wedding in Chicago, and are now living and working dinks in San Jose. My older son, Robert John Duffus, has completed his MBA and will be going to Edinburgh to attend the graduation at Heriot Watt university this summer. I hope he will meet your relative, John Duffus of Grange, (Toxic John) while there. Hope el Nino has not been too rough on your weather this winter. We have had a nearly snowless one, which is a great improvement over last winter when we had a blizzard which knocked down a couple of my outbuildings and bent the house roof. Spent a fine family summer re-building a barn....great for male bonding. The cherry blossoms are nearly over and the daffodils just about to come on. There is a bit of national humour which goes...."as American as apple pie", "as Canadian as possible under the existing circumstances" ....so I can hope your health is as good as possible under the existing circumstances, and your family is flourishing. > David sorry about your computer crashing I do not know if you received this holiday coast thing I sent you about where Barry lives but here it is again to check out and listen to our kookaburras singing in the morning just click on the kookaburras hope you like it and will be in contact with you soon. Subject: Is my time up yet? Great job on the additions to your web site. I've sent the address to a number of Scottish sites for inclusion into their links. Hope you don't mind. I also like the fact that you've revived the Sunday News. Thanks David. I can now stop treating the web site as if it were my own. I'll just relax & see what else you come up with. The following was passed on to me by David Duffus... in the apparently mistaken view that I might be of some assistance to you. My knowledge of the Lords of Duffus ended with the loss of the title after The '15 Rebellion (1715) when Kenneth Sutherland, 3rd Lord Duffus was attainted for treason againgst the Crown. My understanding, after that period, is that the tile was restored to a member of the Sutherland family when he married a Dunbar (who then owned the Lands of Duffus) & changed his name to Dunbar-Sutherland... or Sutherland-Dunbar.... or some such. I believe that the title still rests with the Dunbars but the arms have drastically changed. Regarding your question concerning Lord vs Lordship: The LORD of Duffus was a person... The Lordship was the area over which that person was Lord. Reference Peerage vs Landed Title? I have no idea what to tell you. I am, after all, American born & titles & such don't impress me that much. I never spent much time studying that subject. My family comes from farmers in the Duffus/Elgin section of Scotland. The closest they may have gotten to the Lords might have been if they dropped off some produce at Duffus Castle or Duffus House & accidentally bumped into one of the Sutherlands. The title of Lord of Duffus (in the written records) started with Freskin de Moravia (progenitor of the Sutherlands & Murrays). The lands left that family due to heiresses but was brought back into the fold when a Sutherland eventually married another heiress who held the land. In the early 1700's, the lands of Duffus were heavily mortgaged to Dunbar of Thunderton who foreclosed when payment on his debt was not forthcoming. To my knowledge, the Dunbars still hold some of that ground & are considered as Lairds of Duffus. Whether they are also LORDS of Duffus, I don't know. Either way, they are NOT of the 'Family of Duffus' & are therefore of little concern to me. We were there before there were Sutherland/Dunbar Lords & we'll probably be there when they're gone. Sorry that I couldn't be more help to you on this subject. I suggest that you make contact with the Dunbars as they might be more able to assist you in varifying your friends' claims. Also, Davids' advice regarding checking his web page (& the Lords of Duffus section) is good advice. Hello David, My name is Drew Duffus. I'm taking an information technology course up in Halifax, N.S. I was looking through some Duffus sites and came up with your e-mail address. -see ya later! Thanks so much for your early contact. Yes I am Norman Weiss' adopted son. I presume you have my actual father Gammon David Guinn listed. I was born Gammon Duffus Guinn and my mother was Mary Stairs Duffus. John Wiseman Duffus was my Grandfather born in Halifax, I do have a cousin John Allan Duffus living in El Paso that I am very close to, we were practically raised together. All my 4400 ancestors are in the computer using PAF software. What is the best way to provide you w/ the data. At least, all I have on the Duffus'? I'm looking forward to seeing how far you go back w/ the line you received from Graeme. Your site is indeed worthy of the awards. I love the quality of the photos on your home page - I found it a bit of a visual shock to go to the genealogy pages after the black background. Your site would have taken a considerable amount of research and plain hard work to have got it to the stage it is at and you are to be congratulated on the manner in which you acknowledge your sources of information. It is great to see that citing references has started to appear on web pages. I have attached the two awards for your use on your web page, please put a link back to my site. Sutherland and it has greatly excited me. I am a Duffus from Dundee although I have lived in England since 1971. I know very little of my family for reasons which I will explain. 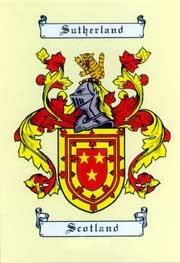 I was born in Dundee in 1954, the eldest of two daughters of Ronald Carnegie Duffus. Sadly my father died a couple of months short of my 10th birthday in 1964 and I never knew anything of his family. My sister is Mary Elizabeth and was born in 1957. Both my fathers parents were already dead and my mother was not wonderful at keeping in touch with any members of my fathers family. However, I have, like most people, become curious and interested in knowing who made me the way I am, although whether that is to be commended or not I will leave others to decide!!!!!. Anyway when I read your personal dedication, it made we wonder if you could be a member of my long lost fathers family. I have done a little research, as much as time and distance allows and I will fill you in with the details. As I said my father was Ronald Carnegie Duffus and he was born in 1908. He was the second son of William Leighton Duffus (I wont fill in all the dates but if you would like them, please let me know). His elder brother who I understand was born on board a ship in 1898 on route to America was William Edwin Duffus, where my grandfather visited regularly and subsequently went to work for a couple of years (Chicago I believe). My grandmother was called Mary Jane Carnegie. almost without break, been born in Dundee and there do not appear to have been very many Duffuss born in Dundee and the father of George Duffus is John Duffus who was born in Dundee in 1799 and married Elizabeth Whitton in1837. It seems to be an amazing coincidence that we both have a ggg grandfather called John who was born in Dundee at around the same time. Could it be that my gg grandfather George and your gg grandfather John were brothers. difficult to trace without any family records to help. By the way, I got a lot of my information from the family grave at the Eastern Cemetery in Dundee, which my grandfather erected for my grandmother and included the other members of his family. I hope that you can find the time to respond and look forward to hearing from you. I am off to Europe on Friday. Checking through my "things to do" I noticed I had never sent your the family tree of our part of the family. As I mentioned earlier, my brother Peter has this. He faxed it to me, and has not yet responding to my request that he E mail it so I can get it more easily to you. In fact, I think there are at least two errors in it and so perhaps I ought to get it properly checked before sending it on. You also asked about Hong Kong. The elections went well with a record turnout. It is true we do not have full democracy, but that is Britain's fault and not China's. Britain had over a century and a half to build democratic institutions and values, and did absolutely nothing about it until just over 10 years ago. Our constitution allows for a gradual build up to full democracy - infinitely preferable to a sudden burst when people are still not quite sure what democracy is and how important it is. And I genuinely believe that is what most people here want. There are one or two strident voices in the democratic camp who have a knack of getting the spotlight and thundering out prophecies of doom and gloom. But they represent only a tiny minority. Other problems have been much more prominent of late. The entire region is in an economic quagmire with economies and currencies crashing through the floor. Ironically, Hong Kong's dollar is the only one in the region to have been stable for years, because ours is pegged totally to the US$. Unfortunately, though, this means that Hong Kong is now much more expensive and our own economy is now in recession. Yesterday's massacre of the markets around the world does not augur well for the next year. We are all hoping Japan will get its act together and start spending more. But Japan moves at a snail's pace and so I am not optimistic. I stop in Thailand on my way to Europe. The Thai currency is down over 40% against the US$ and everything is now incredibly cheap. I buy all my air tickets there, as well as my books, clothes and lots of other things as well. Must off to a meeting. there were so many! This autumn we intend going to Scotland to see this Duffus castle which my father always talked about and which you have comprehensively documented in your Web page. Regards Jim Duffus, Church House, Great Elm, Frome, Somerset BA11 3NZ. and one year he saw an ad on TV for a lawyer named David Duffus. Was that you? If so, I think he called and spoke to you. I'm very impressed with your brother Kevin's accomplishments as a producer, I hope to follow the same kind of career path. sending information. We had a fantastic holiday in Norway, beautiful sceneryand a most interesting group of fellow passengers. Now I am home, sorted out the garden, and helped Henry ( Just finishing his first year at University ) pack up goods & chattels for the long vacation. Have you done the College Run yet ? We filled 2 cars full of belongings !! The washing machine has not stopped since our arrival home. Anyway to more important matters. Henry now has a Digital camera which can take copies of some of the old photographs. Will try & get it all together to send later this week. ( aged 77 ) has recently reduced his working week to 3 days/ week as a lawyer. !!! Subject: New Clan Sutherland Website! There are a few features that don't seem to translate on other PCs. long academic vita. I will send you some family information this weekend. Arthur Louis Duffus asking if he was related to me. I remember the photo of Louis in the paper was my father's double. I wrote sending a passport of my dad saying "there was surely a connection." I got a letter back - saying in a few words there was no connection. I felt I got the brush off. That was over 20 years ago and here I see in your "Duffus Authors" the very chap I wrote to Louis George Duffus of Australia. So by any chance did you get his family tree, for it may prove or disprove whether he was a son or grandson of my missing relative Tom. We are descended from the Rev William Duffus of Boharm nr Rothes. He married Jannet Berber. I have searched the Scottish Records but have been unable to confirm which William Duffus he was. William appears to have been a very popular name in the 18th century. I believe that the Rev,s parents may have been Peter Duffus ( C1738 in Boharm ) mother Isabell Dallachie. As you say the only way we shall be able to sort it out is to visit the area looking for gravestones and other local records. Uncle Herbert saw some of these graves when he visited the area in 1954. Herbert says he found the house they lived in.